Bo particularly loved the kraft pocket-fold design, especially with the mini Rsvps so it was a no brainer! The day invites consisted of lace detailing to the front and inside with a little photo of the couple (a detail Tim was very fond of). Inside lay two double sided inserts, full all the lovely information for their guests. I made a bespoke map, which was a lovely extra touch and such a joy to create. Of course the little rsvp's with matching envelopes and stickers were popped in too! 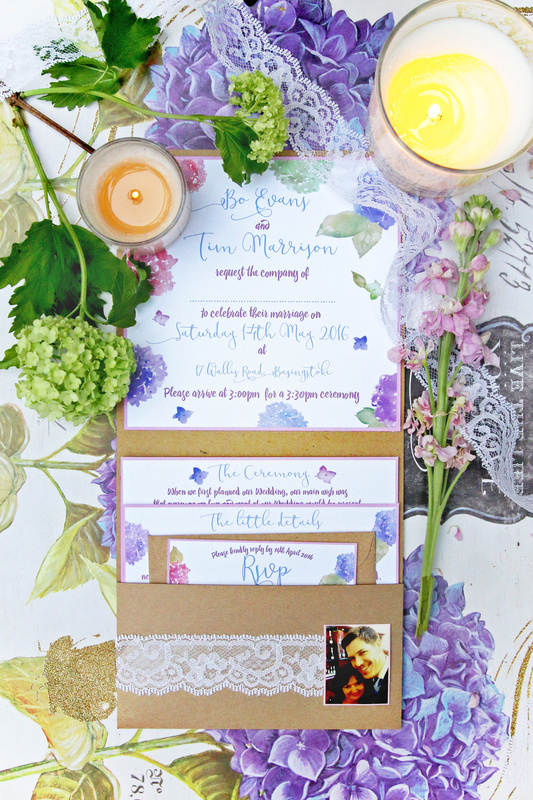 Laura created the most beautiful invites on such a tight time frame. Nothing was too much trouble and we could not be happier with them. She did exactly what we asked her for and added some beautiful personal touches that we wouldn't have even thought of. We have received the most amazing feedback and they only went out last week! Thank you Laura, you have made the perfect start to our Wedding and we couldn't be happier.